(CNN) -- President-elect Barack Obama on Saturday outlined some of his plan to create 2.5 million jobs by 2011, and said he will push for immediate action by Congress when he takes office in January. 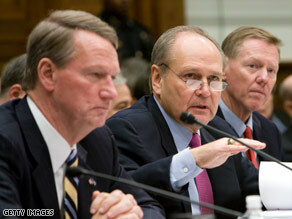 The chief executives of ailing automakers GM, Chrysler and Ford testify before Congress on Friday. Obama wants to make public buildings more energy-efficient, repair roads and bridges, modernize schools, increase broadband access and ensure that health care professionals have access to the latest technology. "Our government now pays the highest energy bill in the world," he said in the weekly Democratic radio address. In addition, he said, "It is unacceptable that the United States ranks 15th in the world in broadband adoption. Here, in the country that invented the Internet, every child should have the chance to get online. "In addition to connecting our libraries and schools to the Internet, we must also ensure that our hospitals are connected to each other through the Internet." "These are a few parts of the economic recovery plan that I will be rolling out in the coming weeks. When Congress reconvenes in January, I look forward to working with them to pass a plan immediately. "We won't do it the old Washington way. We won't just throw money at the problem. On Friday, the Department of Labor released a report showing the U.S. lost 533,000 jobs in November -- the largest monthly job loss since December 1974. This year saw the loss of 1.9 million jobs. The unemployment rate rose to 6.7 percent in November, up from 6.5 percent in October. It is the highest unemployment rate since October 1993. The report came out as Congress and the White House wrestled with financial bailout requests from the Big Three domestic automakers -- Ford, General Motors and Chrysler -- whose top executives testified this week on Capitol Hill. Obama asked Americans to "rise to the moment" to put his plans in place, and said his economic recovery team is working on his proposals. "We need action -- and action now," he said.